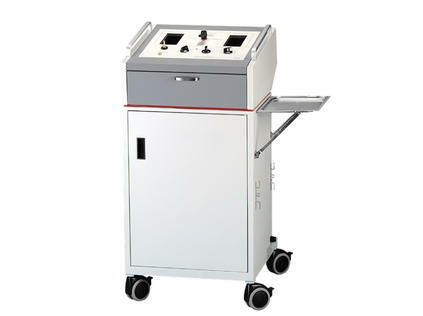 Pulmonex® II is a completely closed system that provides maximum, reliable test results with minimal effort. The Pulmonex® II Xenon System is the best choice for the performance of all regional ventilation studies. It's safe, simple to operate and affordable. The injected bolus of xenon will reach the patient exactly when desired. Oxygen may be added to the system any time during the study with the press of a button. An in-line cartridge containing Soda-Lime absorbs CO2, preventing acidosis. Large breathing passages, two 10-liter breathing bags (air-in and air-out) and motor-assisted airflow combine to provide resistance-free breathing. All three steps of a Pulmonex® II study (start up, equilibrium imaging and washout) are controlled by a single valve handle on the front panel. The valve directs the motor-assisted flow of gases throughout the system. A manually adjusted 15-minute timer initiates all functions, then automatically shuts down the system to complete the study after patient and system washout. With controls conveniently located on the front panel, the user can operate the system and observe the patient and gamma camera from one position. Panel controls are clearly marked for each mode of the procedure with large viewing windows to make it easy to monitor the patient's breathing. A trim, clean design, large handles and total mobility permit easy positioning of the system for studies in both seated and supine positions. Start - Patient breathes room air. System is charged with oxygen. Single breath and equilibrium imaging - This is when you add Xe-133, either a bolus or a homogeneous mixture. An in-line cartridge containing Soda-Lime absorbs CO2 to prevent acidosis. The system is completely closed in this position with no chance of contaminating room air. When the patient equilibrates, the user switches the handle to washout position. Washout - The patient is now breathing room air from a one-way valve through the delivery system and exhaling into the built-in charcoal trap. During washout a pump draws the patient's expired breath through the activated charcoal trap. The xenon is stripped away and only clean air leaves the trap exit port. 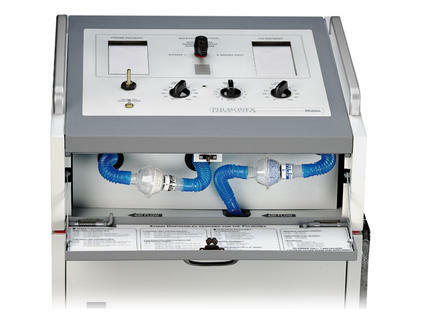 Internal systems of the Pulmonex® II are shielded for patient and operator safety. The system features two built-in gas traps that operate with a blower fan. Exhaled xenon is pulled through activated charcoal housed within two .125" lead shielded "U"-shaped traps. The double traps extend the life of your charcoal and provide a lengthy migration path for xenon effluent, allowing greater decay and absorption before exhaustion. A cartridge containing Drierite serves as a moisture absorber for air passing into the trap. The charcoal trap can then more effectively remove xenon effluent after each study. 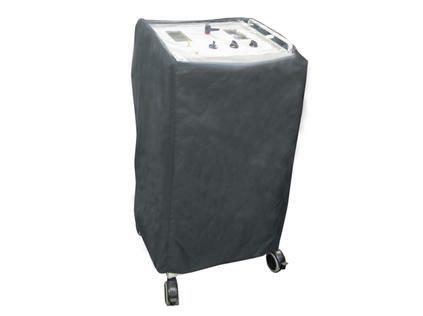 Airflow regulation of the trap blowers assure complete patient and system washout. Averaging 30-50 studies per month, the charcoal trap will last approximately one year; charcoal traps are easily replaced. A disposable bacteriostatic filter, used in conjunction with a disposable mask or mouthpiece, prevents system contamination. 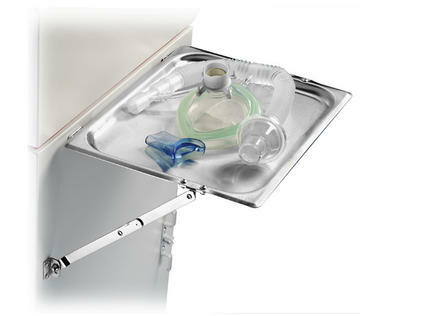 Convenient built-in stainless steel tray for holding disposables, xenon gun, syringe, etc.